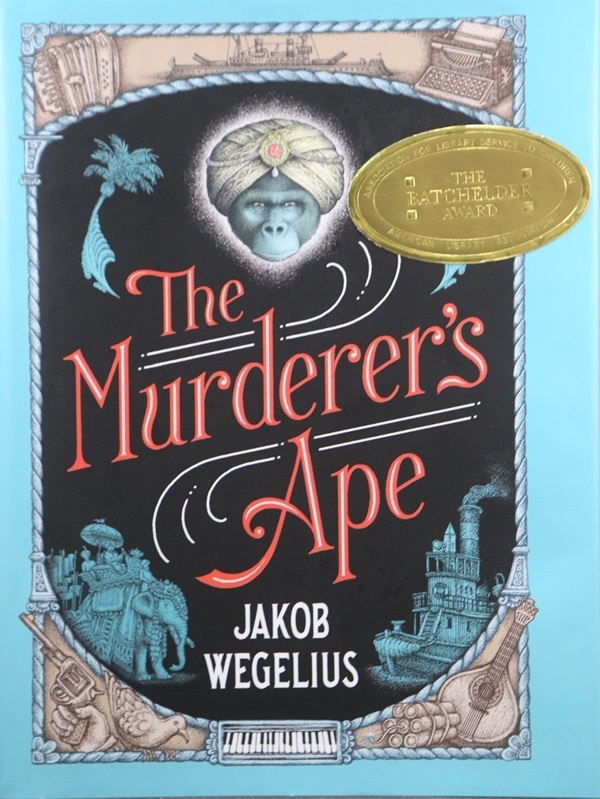 Denver — Delacorte Press, an imprint of Random House Children’s Books, a division of Penguin Random House LLC, is the winner of the 2018 Mildred L. Batchelder Award for “The Murderer’s Ape.” The award was announced today by the Association for Library Service to Children (ALSC), a division of the American Library Association (ALA), during the ALA Midwinter Meeting & Exhibits held Feb. 9–13, in Denver. Originally published in Sweden in 2014 as “Mördarens Apa,” the book was written and illustrated by Jakob Wegelius and translated from Swedish by Peter Graves. When the sea captain she works with is wrongly convicted of murder, Sally Jones, a gorilla who can read, write, and understand humans, embarks on a lengthy adventure to clear the captain’s name. Writing on a typewriter, she narrates the story of her journey from Portugal to India and back again. “Sally Jones is a sentient, intelligent, empathic, talented engineer who is also a gorilla. Publishing her compelling story was a bold undertaking quite masterfully executed,” said Batchelder Award Committee Chair Elizabeth A. Poe. Three Batchelder Honor Books were selected: “Malala: Activist for Girls’ Education” published by Charlesbridge Publishing, “When a Wolf is Hungry” published by Eerdmans Books for Young Readers and “You Can’t Be Too Careful!” published by Elsewhere Editions. Originally published in France in 2015 as “Malala: pur le droit des filles à l’éducation,” “Malala: Activist for Girls’ Education” was written by Raphaële Frier, illustrated by Aurélia Fronty and translated from French by Julie Cormier. In this engaging picture book biography, richly detailed text and illustrations, along with extensive back matter, bring the story of world-famous Pakistani activist Malala Yousafzai to readers. Beginning with her birth, the story details her early family life and how it contributed to her becoming a global advocate for social justice. “The author’s clear, direct writing includes details about life in Pakistan, conservative Islamic beliefs about women and quotations from Malala Yousafzai’s inspirational speeches and blogs,” said Poe. Originally published in France in 2011 as “Quand le loup a faim,” “When a Wolf is Hungry,” was written by Christine Naumann-Villemin, illustrated by Kris Di Giacomo and translated from French by Eerdmans Books for Young Readers. Edmond Bigsnout, a dapper and hungry wolf, heads out in search of a city bunny to eat. The wolf’s quest for a tasty dinner is thwarted by the bunny’s fellow apartment dwellers, thereby leading to a happy ending where politeness and accommodation prevail. “Using humor and irony, this clever turn-of-events story shows the importance of community and sharing in a way that is highly entertaining,” said Poe. Originally published in Brazil in 1999 as “Todo cuidado é pouco!,” “You Can’t Be Too Careful!,” was written and illustrated by Roger Mello and translated from Portuguese by Daniel Hahn. Author and artist Roger Mello has created a fantastical tale that invites readers to engage their imaginations in following the fate of a chain of characters. Readers’ expectations are upended when the narrative reverses itself and links between the characters become evident. “Surreal illustrations perfectly augment the seemingly rambling, but logically linked vignettes that celebrate the versatility of storytelling and explore the nature of connectivity,” said Poe. Members of the 2018 Batchelder Award Committee are: Elizabeth A. Poe, Morgantown, W.V. ; Carolyn R. Angus, Mountain View, Calif.; Mary Beth Dunhouse, Boston; Jacqueline J. Partch, Multnomah County Library, Portland, Ore.; and Kathie L. Weinberg, An Open Book Foundation, Washington, D.C. The Association for Library Service to Children (ALSC) is driven by more than 4,000 members dedicated to the support and enrichment of library service to children. Our members include youth librarians, literature experts, publishers and educational faculty. ALSC supports its members in engaging communities to build healthy, successful, futures for all children. To learn more about ALSC and how to join, please visit our website at www.ala.org/alsc. For information on the Mildred L. Batchelder Award and other ALA Youth Media Awards, please visit www.ala.org/yma.